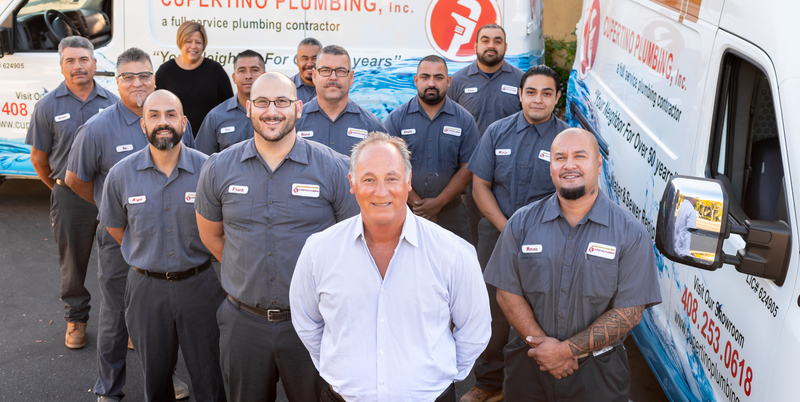 Our Story - About Our San Jose Plumbing Company | Cupertino Plumbing, Inc.
Cupertino Plumbing was established in 1965 by Bill Cardia, a master plumber, and an all-around good guy. People trusted Bill because they knew they could count on him — his work was top-notch and his rates were fair. These were values he passed on to his son, Frank Cardia. During the 1970’s, Bill recognized the need for a community plumbing shop offering replacement parts, kitchen and bath fixtures, and trustworthy advice for both contractors and the do-it-yourself types. Bill purchased a storefront on De Anza Blvd. in Cupertino and opened a plumbing showroom for the public. During this time, Bill continued to hire and train apprentice plumbers, expanding his ability to offer quality and reliable plumbing service to existing and new customers throughout the community. Included on this team was his eldest son, Frank, who demonstrated the same enthusiasm, creativity, and knack for plumbing as his father. Taking what he learned from his dad (Bill), Frank established FLC Plumbing, a full-service plumbing contractor, during the 1980’s. Bill semi-retired, after selling the storefront, but continued to operate Cupertino Plumbing’s service and repair business until he was diagnosed with Asbestos cancer in 1990. The passing of Bill Cardia was a great loss to the community, but Frank Cardia and FLC Plumbing stepped in to take care of Bill’s long-established customers by acquiring Cupertino Plumbing, continuing a legacy of great customer service and quality repairs. In the spirit of Bill’s plumbing showroom, Frank and Rosalinda Cardia opened The Plumbing Bank, a unique bath and kitchen showroom on De Anza Blvd. in Cupertino. In 1991, the company kept growing and expanding in bathroom remodeling and plumbing service repairs. In 2005, with the economy slowing, Cupertino Plumbing decided to downsize and move to a new location in Campbell. In 2008, Frank’s son, Frank, began working in the company, hence the third generation on the way. With the economy improving in 2012, it was time to expand once again and Cupertino Plumbing moved in 2013 to its current location at 2784 S. Bascom Ave. San Jose, CA. Cupertino Plumbing continues to offer unmatched quality and accountability in all areas of plumbing service including new installations, general maintenance, property management, bathroom remodeling repairs, and copper repiping (commercial and residential). If you need a full-service plumber, call Cupertino Plumbing or visit the new showroom, located at 2784 S. Bascom Ave. San Jose, CA. 95124. We look forward to serving you!